HoudahSpot allows you to customize many aspects of a file search: query, criteria, locations, columns, sort order, etc. You will want to save such customized searches for later reuse. HoudahSpot gives you different ways to do so. HoudahSpot searches can be saved as documents or templates. Saved documents are useful for recurring searches. For example, you may want to periodically check your Downloads folder for files that need archiving. 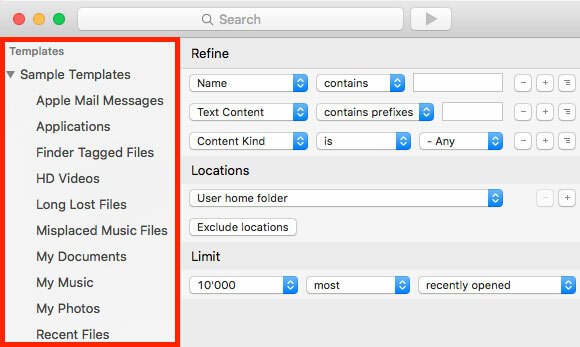 Saved search documents can be modified and re-saved. When you close a saved search, HoudahSpot will ask if it should save changes. Templates serve as blueprints to create new searches. A set of pre-installed sample templates is available from the Templates menu or from the sidebar. You can create a new template using the “Save As Template…” menu item from the File menu. Opening a template creates a new search as an identical copy of the template. The original template is not modified. When saving a search – as a document or as a template – HoudahSpot remembers whether it was running (showing results) or not. Therefore, if you open a saved search that was running – or active – when saved, the search starts immediately and results are pouring in. Use active saved queries to get quick access to frequently used files. E.g. installed applications, recently used files, documents pertaining to a given client, etc. Inactive saved queries – searches that were stopped when saved – serve as starting points for new searches. Open them to find a ready-made set of search criteria: you just need to fill in values for the criteria you want to use, then start the search. Next Next post: Why Geotag Photos?